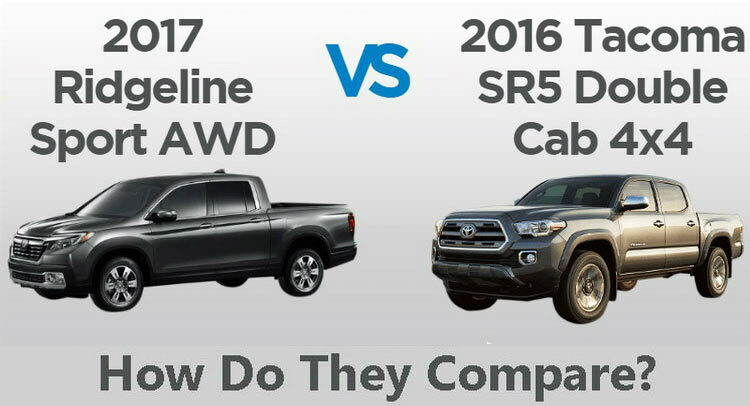 2016 Toyota Tacoma Vs 2017 Honda Ridgeline – Which One Do You Prefer? 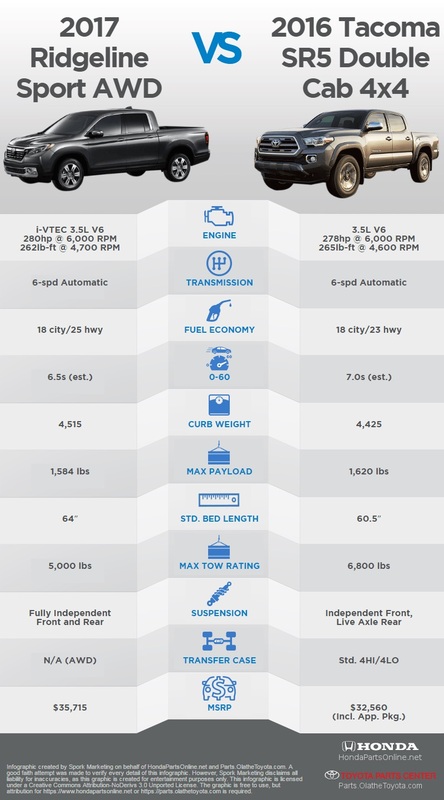 This comparison chart was put together with the help of HondaPartsOnline and PartsOlatheToyota, demonstrating that comparing these two pickups isn’t as easy as it may seem. If overall capability is your number one priority, then the 2016 Tacoma might have the upper hand, but according to HondaPartsOnline director Gib Goodrich, looking strictly at the numbers might cause you to miss out on the intangibles. While that does make sense from an overall perspective, Tom Blackman from Parts.OlatheToyota likes to look at things a bit differently. That sounds to us like ‘shots fired’, because calling the Ridgeline out like that was sort of a low blow. However, looking at the numbers, it’s hard to form an argument against it. 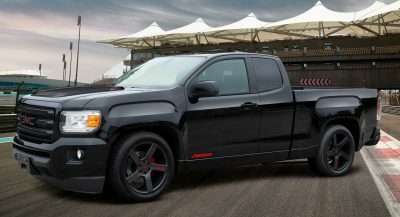 All in all, where Blackman argues that the Tacoma is the more capable truck (particularly off-road) and costs less, Goodrich brings up how the Ridgeline is better than the Tacoma in terms of comfort, interior quality and handling. I would prefer the Honda. But just barely. I’d take the Tacoma because it looks better than the deformed Pilot that Honda is calling the Ridgeline. personally I liked the Ridgeline as the funky, kinda kitschy kinda chic pickup it was in the same way the Avalanche/EXT were. One is a truck. The other is a minivan with a bed. That is true. The chassis is the same as the MDX and the Honda minivan. Too small. What you want is an F-950. Is that even a valid question? Tacoma over that Odyssey truck. The Toyota, at least it’s the real thing. Tacoma but I hate trucks. If you need a truck, buy a truck. If you need to look like you are a truck, buy the wannabe. Who makes a truck with no AWD/4-wheel drive capabilities? It’s like Bo Hanan said, “minivan with a bed.” I like the original Ridgeline, it is different and quirky-looking, but, I see that Honda has not gotten a handle on the price. One is a girls truck, the Honda, and the other is a young mans truck, the Tacoma. Totally different customers really. Toyota has an off road heritage, to support the tough truck feel, where Honda has no heritage in this segment and are very late to the game. No young man would be caught dead picking up the friends and girlfriend in a Ridgeline. Honda for me. I want something that is comfortable to drive. The seating position in the Toyota feels like you are sitting on the floor. Don’t care about towing or off roading (have a bike for off road). This pilot/minivan with a bed suits me fine. Unlike most truck owners my personal accomplishments don’t end with the vehicle I drive. P.S. soccer mom’s have moved onto F150’S where I live. Honda. The nay Sayers are not of high intelligence. Honda engendering is the best. Look it up, it has bigger, beefier, more durable turn buckles, linckages, berings, struts, breaks, the list goes on, than the non-pro taco, Colorado/gmc, and frontier. Body on frame guys… Is old… That’s how Henry Ford made model T’s. If you like tech that old skip the Ridgine. I read ya 100%, but Seriously? You might want to activate the “Spell Check” app on your “High Intelligent” phone before you click submit. Honda will struggle yet again to sell these because they just don’t look like pick up trucks. 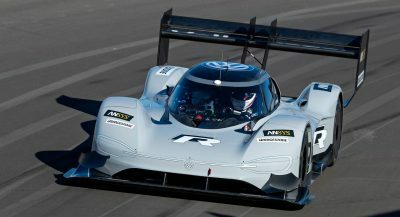 Some bigger tires, more clearance and a much less effeminate design would be a good start. Honda. Seriously these guys wanting to compensate for their own inferior size. 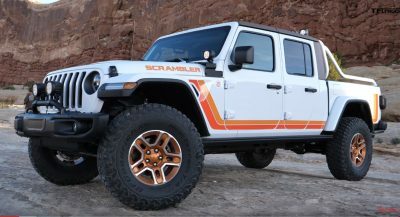 I don’t need to off-road and cause damage to my truck with costly repairs and I don’t need to be 20 feet off the ground with massive tractor tires to show off and I’m not going to be towing anything over 5,000 lbs. I’d much rather ride in the best comfort be able to get in my vehicle easily without a ladder and go to the dump sometimes pick up big appliances or a couch television ect and this does all that and more. This is an everyday type of truck. Very few people need anything bigger than this. The older Ridgeline was ugly to say the least. Very boxy style that many did not like. The new Ridgeline definitely looks like a Pilot but I like that and this does more than a Pilot. It will be a success unlike the older ridgeline because of the style change! I do like the Tacoma as well but not as much as the Honda. The 2016 GMC Canyon is sweet as well but nothing beats the quality and longevity of Honda and Toyota. Get over your Ego and accept that this is a truck and it is just as capable to get the job done as any other midsize truck. When I’m at 250,000 miles with my Ridgeline your truck will be in the junk yard or digging a hole in your wallet! I prefer the Ridgeline because of the overall qualities. I’d rather have a comfortable vehicle with a back seat you can actually use. Then again, I don’t need to compensate by driving something that looks like a largemouth bass about to be hooked. Toyota Tacoma’s are great for little people. Tacoma is for Dads and Honda is for Moms. A vehicle is a tool. The right tool for the job. I have 4 vehicles for different purposes/roles. I notice the older I get, the more important comfort level becomes. I would have to test drive both and decide the purpose of the tool.